Silent, deadly, delicious. Drugfoods kill over 240,000 Americans every 2 months from degenerative diseases they cause, accounting for more than 2/3 of U.S. deaths! 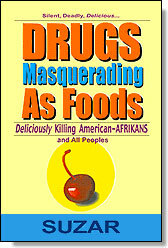 Blacks lead the nation in mortality rates from drugfood diseases! Sickness, not Health, is a Trillion dollar-a-year industry in America. And you, yes YOU are a Drugfood Addict! Among other vital things, this life-saving book identifies The Five Fatal Foremost Traits of Killer Drugfoods and just which "foods" are really Drugs Masquerading as Foods, killing us slowly, little by little, with each delicious bite! Disease & Death been so pleasurable! Delicious slow death. There are worse ways to exit! are and save yo self! presented to us as food. Dr. S. Epps, N.D., D.M. except for brief passages in articles and reviews. by The Learning Company & its licensors. Written, designed & partly illustrated by Suzar. First Printing, First Edition, September 1999.
not medical advice or prescriptions. Disease & Drugs are BIG business. The commercial foods of the "Western Diet"
Is an all-fruit diet unhealthy?